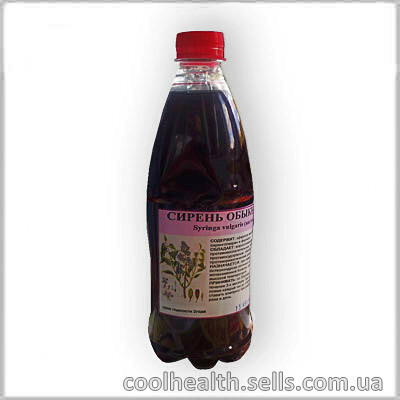 Arthritis Arthrosis Treatment of Joints Diabetes Flu Bronchitis Arthritis treatment Tincture of Lilac properties recommendations use buy store of traditional Medicine. Pyelonephritis Heel Spurs Calcination treatment at home buy traditional medicine. The Lilac is a deciduous shrub with foliage in a cup and belongs to the family Oleaceae. Leaves of lilac are egg-shaped with solid edges, petioles, arranged opposite each other. Although there are species of lilac with a completely different configuration. The fruit of Lilac - dvuhgnezdnaya box, flat, oval, with 2-4 seed with wings. The plant blooms every year very heavily. Lilac prefers to grow in a garden Park near the houses. The plant likes a neutral soil and does not tolerate excessive content of moisture in the soil. The Flowers Lilac - a great place to gather nectar, the constantly attracts bees. Bushes beautify at the time of the may flowering of the surroundings, the countryside, urban parks, and suburban areas. The plant is very often used as one element when creating a landscape design. Also, the siren has found its place in folk medicine, allowing to cure a very wide range of different diseases. Useful raw materials are Lilac flowers, buds, bark and leaves of the plant. Lilac keeps its useful properties for two years. The Liliac is primarily used as a means has a diaphoretic and anti-inflammatory effect. Due to the content in the plant many nutrients it is used as a tool that reduces fever and reduces pain. Lilac helps in the treatment of febrile diseases. Lilacs can cure diabetes. The Buds of Lilac is used for lowering blood sugar. Flowers help in the treatment of malaria, rheumatism and diarrhea. Infusion of flowers is used for sore throat, whooping cough, shortness of breath, diabetes. A decoction of Lilac is an excellent cough remedy. Infusion of Lilac helps to get rid of diarrhea, pains, bruises, wounds, and neuralgia. Fresh leaves of Lilac have wound healing property, so they are used to make poultices for treating wounds, panaritium and boils. Scientific medicine is wary of drugs of Lilacs, because of the included sirigina glycoside, which upon the decay of the formed hydrocyanic acid - the strongest poison. Therefore, venutre preparations containing in its composition Lilacs, should be used cautiously and only after consulting with your doctor. Lilac contraindications and symptoms of poisoning. The contraindicated treatment on the basis of Lilacs when expressed liver and kidney failure, pregnancy and in case of individual intolerance. Because the Lilac plant is poisonous, should take all precautions not to exceed the stated dose and not to use for a long time. Do not use for treatment in children. Venutre preparations on the basis of Lilacs should be applied with caution and only after consulting with your doctor. The Flowers Lilac Tincture composition. The Tincture of Lilac properties. The Tincture of Lilac application. at a flu with a high fever. Use: 30-40 drops (incomplete teaspoon) 3 times a day 30 minutes before meals for 3 months. At high temperature - 1 tsp. every hour until stabilized. External use: put a compress for bruises, bruises and festering wounds 3-4 times a day.